This compact aluminum fishing rig may be all the boat you need. The Lund 1600 Fury is what we here in the Northwoods used to simply call “a boat.” If you rented a cabin with a boat, or traded your snowmobile for a boat, or met a girl with a boat, what you meant was an aluminum fishing boat with a tiller outboard, and it was very likely a Lund and almost certainly red. 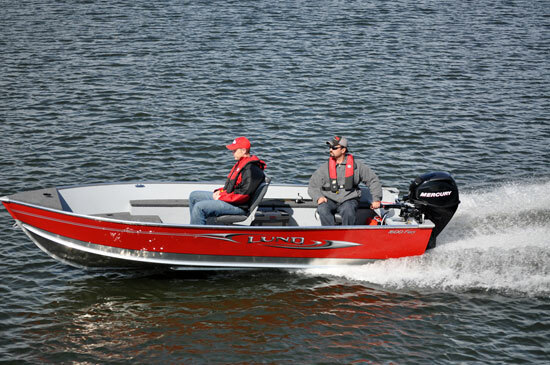 Lund has been selling red aluminum V-hull fishing boats for generations, but the 2011 Fury is a nice step up from the one grandpa had, with a new bottom design and amenities that make it a great weekend fishing rig. A boat, a motor, and a buddy make for a great day. 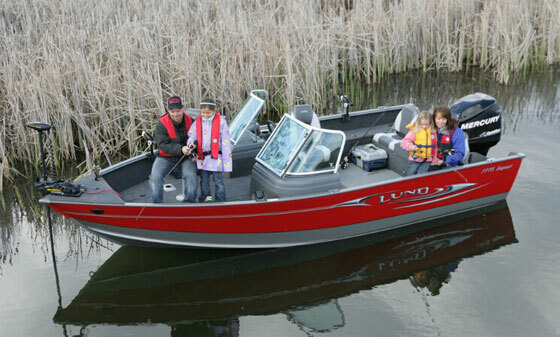 The Lund Fury is an affordable aluminum fishing boat that offers more than basic features. Lund will offer two Fury models. The 1600 is 16’2” long with a 6’1” beam, and is available with tiller steering or with a side console for remote steering. It’s rated for up to 40 hp in either configuration. 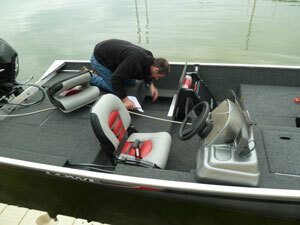 There’s also a 14’9” 1400 Fury that’s an inch narrower, and comes only with a tiller motor up to 30 hp. The Fury models have a flat floor and pedestal seats, and will replace the bench-seat WC Deluxe models in the Lund range. 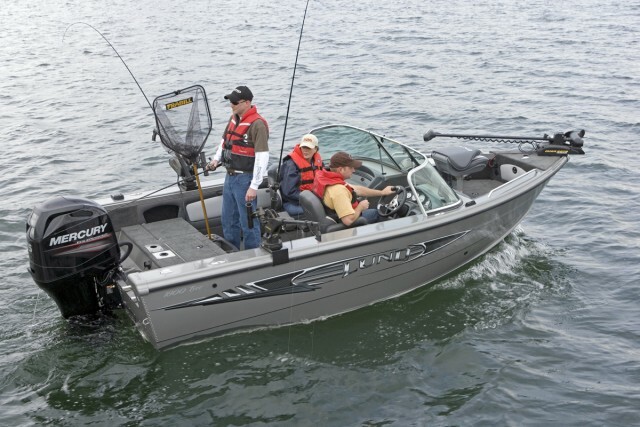 The Fury line is intended to be economical enough to be a second boat for some owners, or a boat for occasional anglers who don’t want to sink big bucks into a weekend fishing rig. 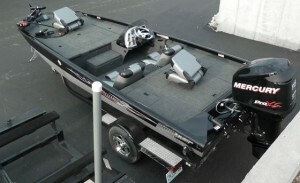 Pricing on the 1600 Fury starts at $7,895 with a rope-start, 25-hp Mercury four-stroke motor and a ShoreLand’r trailer. The boat I tested had a Merc 25 with electric start and power trim, which bumps the price to $8,695. The 1600 SS Fury with a side console starts at $8,995 with a Merc 25. A portable fuel tank and battery stow below the open splash well. A bilge pump fits in a sump between them. The old WC Deluxe had the classic Lund running surface, with a flat bottom aft and radiused chines. The new Fury utilizes the latest Lund Integrated Power Strake (IPS) hull shape, with six degrees of deadrise and a flat pad area on the centerline aft. The entry forward is also deeper than the old-style hull, and Lund claims the result is a smoother ride and improved performance, as that pad is supposed to feed less-turbulent water to the propeller. This hull also has a pair of lifting strakes and a wide spray rail that runs from the transom to the bow. 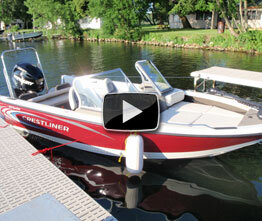 Like all Lund boats, the Fury features all-riveted construction. The Fury interior offers lots of storage spaces for a boat this size, and some basic fishing amenities. The flat floor gives way to inwale storage lockers port and starboard, with room for a dozen 7.5-foot rods. 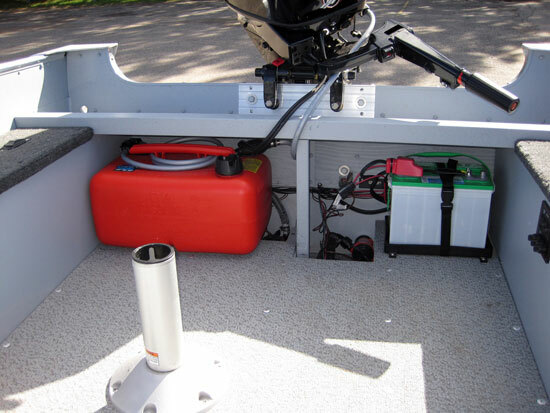 Here’s a nice detail – the bottom of these outboard lockers angles up towards the bow so rods rest level, and also to keep smaller items from bouncing or rolling forward and out of reach. The boat comes with two pedestal fishing seats, and there’s one seat socket on the raised bow casting platform. 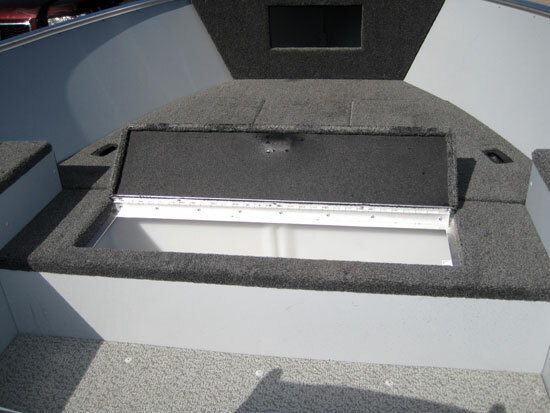 There are two more storage compartments in the bow deck, plus storage space under the bow peak mounting plate, which is big enough to accept a trolling motor. A 10-gallon live well, 34” long, is located at the aft end of the bow platform. The Fury comes with easy-to-clean vinyl flooring on the main deck, and carpet on the bow platform and on top of the side lockers. Vinyl on the bow deck is an option. Chrome-plated cleats are placed inside the hull just below the gunwale, where they won’t snag fishing line. A wide livewell hatch makes it easy to drop in a lunker, and its underside is insulated to help keep it cool. Two big hatches in the forward deck cover generous storage. The splash well is about 11” deep, and does not quite cover the portable fuel tank that stows below, but Lund points out that this also provides a few more inches of interior space. The plastic fuel tank is not secured, so it might bounce around a little when it’s near empty and light. There’s also a cut-out for the bilge pump under the splash well, and the battery is secured here in a good rack. I’d like to see Lund tidy up the wiring under here, perhaps placing the main harness in a plastic conduit. Switches for lights and the live well are on a panel on the port inwale, facing the operator, where there’s also space and access to power for mounting accessory electronics. It was a really rough afternoon when I motored the Fury onto a Minnesota lake for a test run in October. With a passenger, we had about 250 pounds of weight in the boat, and it planed off neatly with the 25-hp Merc running a 9.5-pitch prop. On flat water I saw a top speed of about 21 to 22 mph on GPS. I don’t see the need for more power on this boat. I also would not invest $400 in power trim for this boat unless I was going to see a lot of shallow water. The Fury ran at a nice angle with the motor trimmed down, and I didn’t note that trimming the motor out increased top speed by much. Given the conditions, I was really impressed with how dry we stayed even with a quartering wind. The little Lund also feels really solid on the water, never “oil canning” over big waves or wakes. This new hull seems to carve turns a little better than the old flat-bottom Lunds. Lund says the 1600 SS Fury with the console will run about 32 mph with a Mercury 40 on the transom. Lund pitches the Fury as an affordable choice. Alternatives in the value end of the market include the Lowe A160T which retails for about $9,635 with a Mercury 25 electric start and a trailer. Tracker does not offer a deep-V style boat with a tiller, but its modified-V Panfish 16 starts at $8,495 with a stick-steering Mercury 20 electric start, a MotorGuide trolling motor, and a trailer. 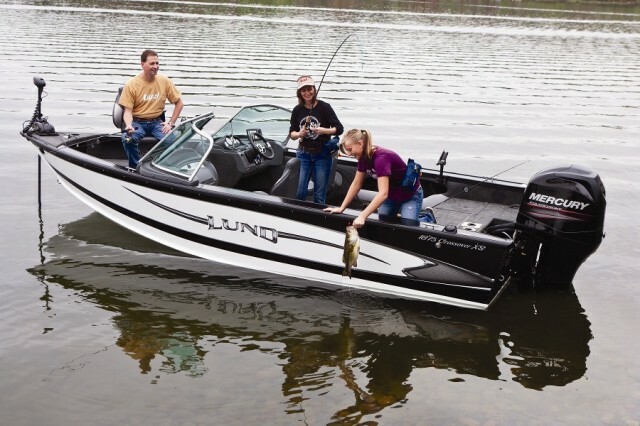 If it’s time for you to get “a boat,” the Lund Fury offers more than basic utility at a good package price. And you can still get yours in red. 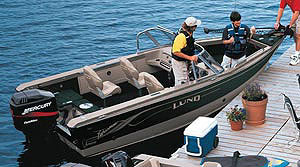 For more information, visit the Lund Boats website. Charles Plueddeman is Boats.com's outboard, trailer, and PWC expert. 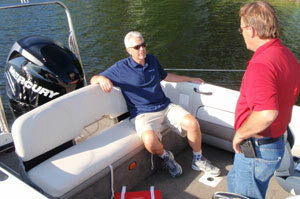 He is a former editor at Boating Magazine and contributor to many national publications since 1986.